The Festivals of the Poplifugia and the commemoration of Romulus are celebrated on July 5 and July 7, respectively. 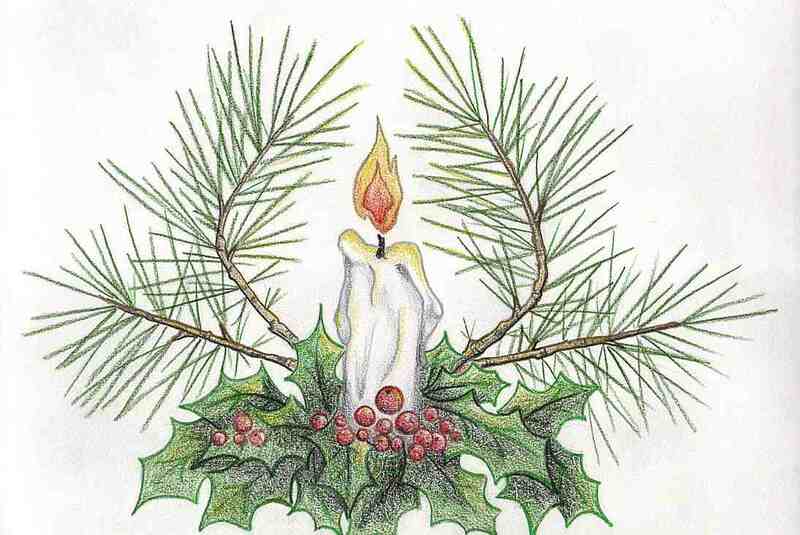 These two festivals are thought to be a continuation of the same festival, as it was customary for the Romans to have festivals that ran on several days but skipped the even-numbered days because they were considered ill-omened in Rome. There was also a Rumilia festival that might have been celebrated at the same time. 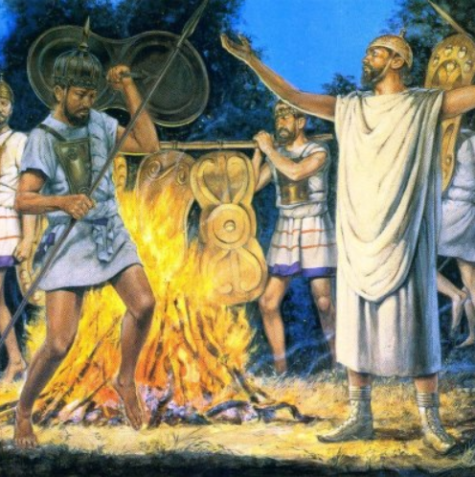 Although much has been written on this topic, it is not well understood, because the Romans had an extremely conservative religion, in which they continued to do rituals, but they did not remember what they were for, and much of the information about their religion has been lost or deliberately destroyed. The Poplifugia was a ritual in which someone was chased out of the Regia, or “King’s House”, actually the formal residence of the Sacred King of Rome. This early July date corresponds approximately to the time of slaughter of livestock in Mediterranean countries which have a dry season during most of the summer during which there is no fodder for cattle. Its name which is interpreted to mean, “The Flight of the People”, may refer to the sacking of Rome by the Gauls in 390 BC. However, it is impossible not to notice that the word popli- in Poplifugia, and which is interpreted as meaning `people’ is very similar to the word popa which is the Latin word for the attendant who actually slaughtered the animals at a sacrifice, that is, it was the job of the popa to hit the animal in the forehead with an ax which stunned it. Someone else cut the animal’s throat so that it bled to death, and the whole operation was organized by a priest who spoke the religious formulas and directed everyone on what they should do. If the festival was originally called a *Popafugia (“fleeing of the popa or axeman”), it would be even more completely in line with the Bouphonia, as it was performed in classical Greece. Nevertheless, the connection has been made between the Poplifugia and the Greek Bouphonia and both are thought to embody the myth of the killing of the first cow, which makes up the Indo-European creation myth, known as the Primal Cow Creation Myth. The Festival of Bellona took place on June 3rd in Campus Martius, near the Temple of Bellona. This was largely just a huge feast in honor of Bellona who had helped them in war. This festival was also a celebration for the dedication of the Temple of Bellona. ~Information compiled from various sources. Memorial Day is the day meant to be set aside to specifically honor the war dead. As such, it is an appropriate day to observe rituals to honor the Einherjar: the battle-slain warriors who are taken to Valhalla. Who are the Einherjar? They are an army of all men who fall in battle, they are adopted as Odin’s sons. He allots to them the halls Valhalla and Vingólf. There they await Ragnarok, when they will join the Gods in fighting the Giants. They spend most of their time fighting, eating, and drinking. Of course, not all of the battle-slain go to Valhalla some also go to Freya’s Hall, but many modern pagans will honor the war-dead, especially their ancestors who served at this time. Others will honor the Einherjar on Veteran’s Day instead, even though, technically Veteran’s Day is intended to first and foremost honor those living Veterans from past military service, it is also used to honor those currently serving, and to a lesser degree those soldiers now dead. In Norse mythology, the Einherjar (Old Norse “lone fighters”) are those that have died in battle and are brought to Valhalla by Valkyries. 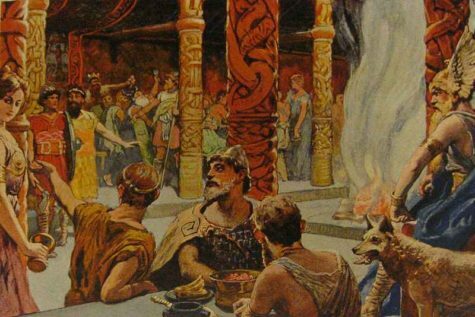 In Valhalla, the Einherjar eat their fill of the nightly-resurrecting beast Sæhrímnir, and are brought their fill of mead (from the udder of the goat Heiðrún) by Valkyries. The Einherjar prepare daily for the events of Ragnarök, when they will advance for an immense battle at the field of Vígríðr. Accounts of Valhalla describe it as a large hall, decked with the implements of battle. The Einherjar are described as being well-hosted, they are fed on pork and mead, and each day, the Einherjar practice at the art of battle. They engage one another in terrible, bloody conflicts, and at the end of the day, come back to life, and walk off the field, the best of friends. 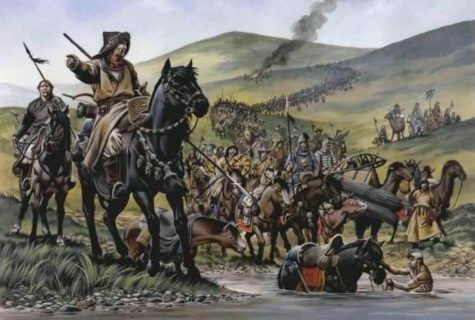 It seems probable that historically, the Einherjar could be best described as some sort of “elite” troops, and that going to Valhalla was not necessarily the fate of the common soldier. 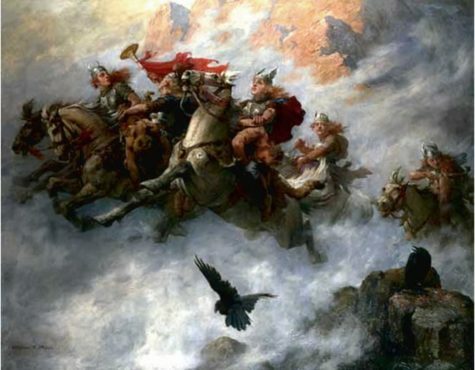 Odin was traditionally followed by members of the ruling classes, not by ordinary folk. Adding to this the idea of the Einherjar fighting day after day, and enjoying it immensely does seem more in line with an elite unit, it seems likely that an ordinary draftee might get a little tired of day after day of fighting. In actual modern-day practice, Einherjar blot has tended to become a day to honor all of those who die in wars, and to a lesser extent, veterans in general. How exactly does one reconcile these two different images of the Einherjar? One thing is clear, it was never a part of old Norse thought to hold to one view of the afterlife. Where you ended up after your death seemed reliant on which Gods you followed in life, and what sort of person you were. 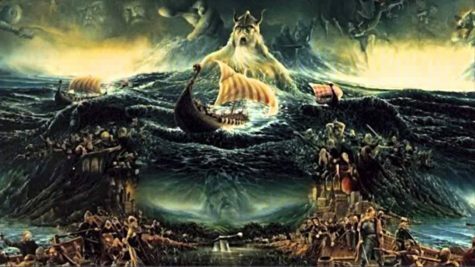 In Norse mythology, Ragnarök (Old Norse “final destiny of the gods”) is a series of future events, including a great battle foretold to ultimately result in the death of a number of major figures (including the gods Odin, Thor, Týr, Freyr, Heimdall, and Loki), the occurrence of various natural disasters, and the subsequent submersion of the world in water. Afterward, the world will resurface anew and fertile, the surviving and reborn gods will meet, and the world will be repopulated by two human survivors. 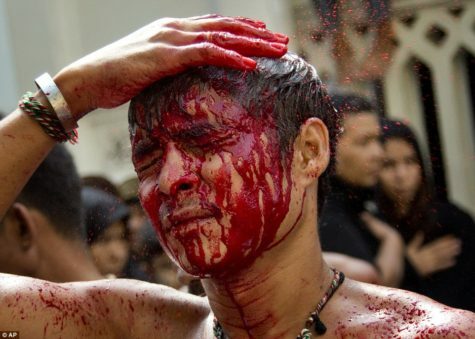 Dies Sanguinis (Day of Blood) was a festival held in Ancient Rome on 24 March. Also known as Bellona’s Day, this was an occasion when the Roman votaries of the war-goddess Bellona cut themselves and drank this sacrificial blood to propitiate the deity. The worship of this asiatic goddess was introduced into Rome apparently by Sulla, to whom she had appeared, urging him to march to Rome and bathe in the blood of his enemies. Note: She should not be mistaken for the Roman Bellona, whose festival, which was largely a huge feast, took place on the 3rd of June. For her a new temple was built, and a college of priests (Bellonarii) instituted to conduct her fanatical rites, the prominent feature of which was to lacerate themselves and sprinkle the blood on the spectators. To make the scene more grim they wore black dresses (Tertullian, De Pallio) from head to foot. The Priests of Bellona (also known as Bellonarii) practiced other rituals on Dies Sanguinis, one rite being to mutilate their own limbs, such as their own arms and legs with a sharp knife or knives in order to collect their own blood to either drink, or offer to their goddess Bellona in order to get her to invoke her war fury on them. In some instances, they would even drink their own blood in hopes that Bellona would grant a warlike frenzy. 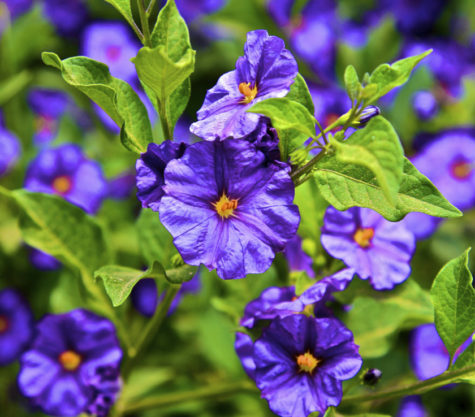 There also a plant known as the Bellonaria plant (solanum). Which is a corruption on the name Belladonna, a deadly nightshade, was used by priests at this festival, Dies Sanguinis. When a priest ate its seeds, they would start to hallucinate. Those hallucinations were used by them to make prophetic and oracular statements in the name of their goddess. In the Roman calendar, March was sacred to Mars. The “jumping priests,” or Salii began the Festival of the Salii on March 21 with a purification of the sacred trumpets that the Romans carried off to war. That date was originally the Roman New Year’s Day because it was the start of the growing and campaign season. On March 21, the Salii marched to the Regia taking the bronze Ancilia, the sacred shield that had fallen down from heaven, and its 11 copies. They danced through the streets carrying poles with the shields mounted on them in their left hands. With their other hand, they banged the shields with a drumstick. Even in the time of Cicero, the Carmen Saliare they sang was so ancient that he could not understand it. At the end of each night, they would stop at a place to be feasted before starting up again the next day. This festival would end on March 24 when they would return to the Regia and return the shields. Hola Mohalla is an annual Sikh festival, celebrated extensively over three days (March 13 thru 15) mainly at the Anandpur Sahib Gurudwara, in the state of Punjab. It is a martial fair that was introduced by Sikh Guru, Guru Gobind Singh, to fortify the Sikh community by carrying out martial training and mock-drills, along with religious discussions. The festivities of Hola Mohalla begin by visiting the gurudwaras for early morning prayers. Durbars are held and the Guru Granth Sahib is read. Kirtans and religious lectures are carried out and after the religious ceremonies are over, the ‘prasad’ is distributed among the people. The evening is filled with a lot of anticipation and thrill, as martial members of the Sikh community (Nihang Sikhs) display their physical strength through daring acts like mock-battles (Gatka), sword-fighting displays, archery and exercising on speeding horses. They also splatter colors on the audience. This is followed by cultural activities including music, dance and poetry programs and competitions to unwind the charged up atmosphere. A procession is set out on the last day, and the Panj Pyaras walk in front crossing all the major gurudwaras in that area. Hola Mohalla is the time to celebrate and dedicate oneself into community service. ‘Langars’ are organised, and local people come forward to help by arranging the raw materials for the langar, cleaning the gurudwaras, and washing the dishes. March (Martius), the first month of the lunar calendar, was named after Mars and the entire month was dedicated to Him. The festivals reflected a purification and regeneration of the arms and fields, marking a time when farmers had to think of cultivating and protecting their lands. The efficacy of Mars’ divine aid was much needed in preparation for the seasonal crop growth and upcoming military campaigns, as wars often began or were renewed in the spring. March 1st was the lunar calendar’s New Year’s Day, and may have also been Mars’ birthday. 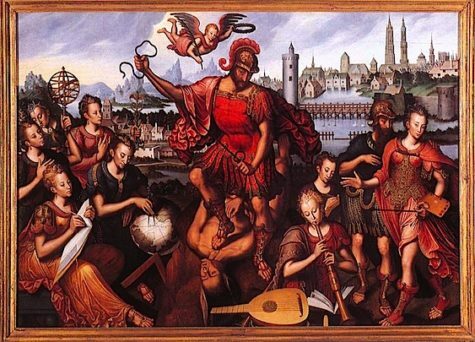 The festival of Quinquatrus (named for its length of five consecutive days) commenced on 19 March when the ancilia of the Salii and the weapons of the whole army were purified. On 23 March, the Romans venerated Mars during the Tubilustrium, a cleansing ceremony for the trumpets used in sacred rites and the instruments of the entire army. A subsequent purification rite was performed on 19 October during the Armilustrium, and the Salii, commemorating the return of the legions in the fall, made their final procession through the streets of Rome. It signified the end of the military campaign season when arma (arms) and ancilia were purified and laid to rest for the winter. How do we relate to Mars this month? With Mars, there is no contemplation before action. The drive associated with Mars differs from that of the Sun in that it is self-assertion rather than assertion of the will; it is raw energy rather than creative energy. Mars is still the essence of the god from antiquity. He is still the captivating aggressor, the rouser, and the protagonist of destiny; breathtakingly candid in His purpose and deliberate in His bounty. 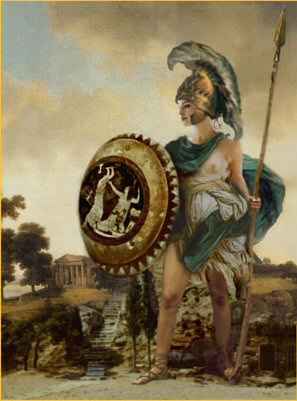 Mars personifies a vigorous energy that carries with it its own reproductive weight, immersed in singular ambition, and seldom outdone. He is the quintessential model of male sexuality; the catalyst for creation Who leaves little doubt that our perpetuation is imminent and our survival inevitable. Yet His artful passion is lucid; a flowing expression steeped in honorific intent and delivered with remarkably unbiased conveyance. The expression of our basic needs remains the one true constant among all living beings. When we peel back the layers of aspirations and ideals, we reach the crux of the human race with uncanny fidelity; the instinctual drives that have served us so well. It is here, at this center that we find Mars, ceaselessly reminding us that no matter how far we venture from this place, the road back is always nearer than we realize. How do we honor Mars this month? Mars represents the instinctive nature still evident in all species: that of survival and protection. In antiquity, Mars’ reigning aspects were interwoven into a society that understood a definable application of pursuit and preservation. The Romans recognized the necessity of this sequence as the occurring truth behind any deliberate progress. These enduring principles are at the very heart of Perpituitas; qualities attributed to our role as the caretakers of our posterity. 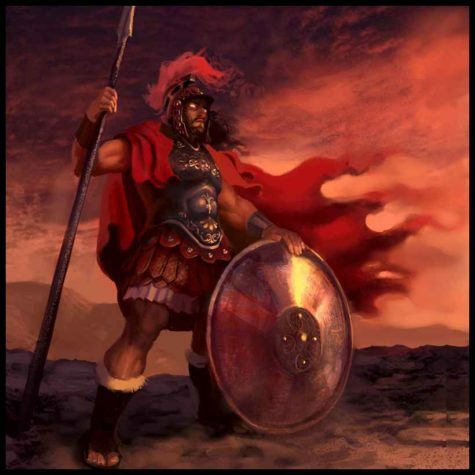 In His warrior aspect we associate Mars with iron, but an iron will is of the same caliber. Protection has always been our gift to those we love, and a duty to ourselves. Though we no longer spend our days in the fields, the fruits of our labors still determine the quality of our life. Pray to Mars when you need to shift into another gear, to bring your purpose from wishful pondering to fruition and culmination. Look to Mars when your spirit needs reawakening and you find yourself lost in the cycle of delay, needing to summon up the courage to act. When the mundane begins to chisel your determination into quiet resignation, let Mars hear your call to arms. His still powerful voice speaks volumes to all who listen. Mars continues to provoke and ignite while craftily providing us with His earthly wisdom; those universal gifts of our own nature which allow us to fully embrace our life’s experience and remain secure in our duration. 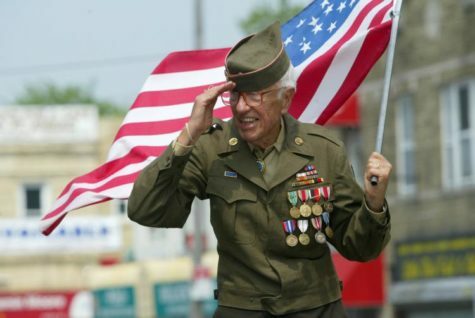 This federal holiday was changed to Veterans Day in 1954. At that time, it became a day to honor all the men and women who have served in the armed forces of the United States. Each year, special ceremonies are held at Arlington National Cemetery in Virginia. An official wreath-laying ceremony is held each Veterans Day at the Tomb of the Unknown Soldier in Arlington National Cemetery, while parades and other celebrations are held in states around the country. Consider spending some time on-line learning more about our nation’s veterans. The Great War Society has developed a Web site devoted to World War I educational materials. The World War II Memorial celebrates the victory of “the greatest generation” with a design that uses moving water to harmonize with its natural surroundings. Visit the Korean War Veterans Memorial online; this moving memorial, dedicated in 1995, is the latest addition to the National Mall in Washington, D.C.
See a registry of all the names on the Vietnam Veterans Memorial Wall in Washington. Learn more about the military men and women who are on duty today.